Have you ever double frosted a cake? I had not until I made this one. I wasn't even sure 'double frosted' was a thing. Turns out, it's a really good thing! Especially when the salted caramel and mocha frostings intermingle so deliciously. This cake recipe would've been right at home in the pages of Sea Salt Sweet, but my editor kindly noted that I already had many chocolate and caramel recipes inside (My question: Can you have too many?). The caramel frosting is my favorite element. It has an almost fudge-like consistency. It's delicious but sets up quickly, so it can be a little difficult to spread on the buttery cake layers. 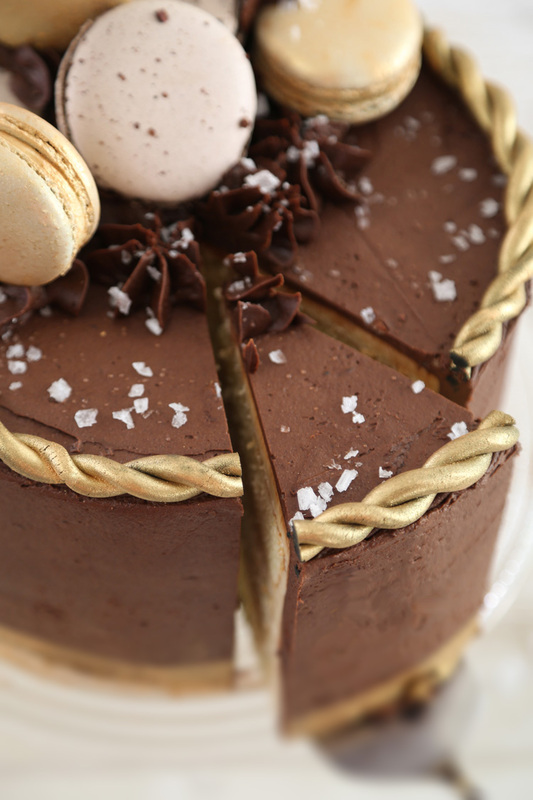 I recommend using a cake icer decorator tip (#789 Wilton) to pipe the caramel layer onto the cake. You can see the technique in this Wilton video. A few small nautical touches - the ship cake topper, the golden rope - fancied this cake up without too much work. I found the cake topper in this Etsy seller's shop, and the gold rope was made with chocolate fondant and this gold luster dust. I also used a little of the dust to glitz up the macarons. It's so easy to do, just dip a small artists' brush into the gold dust and dry-brush it on. Instant blingy macs! The flake salt on top is delightful - it gives a slight crunch and a big flavor boost to the mocha frosting. Speaking of mocha: the coffee flavor in this frosting is not overt but if you're not a fan, the instant coffee mixture can be omitted from the frosting recipe completely. I really enjoyed making this cake. Admittedly, it has quite a few steps but the end result is well worth the effort. The butter cake layers are fluffy and the perfect blank canvas for caramel-mocha double frosting. I recommend using a #789 cake decorator tip to cover the cake with caramel frosting. The caramel frosting is thick and almost fudge-like, so it's not easy to spread but it pipes just fine! 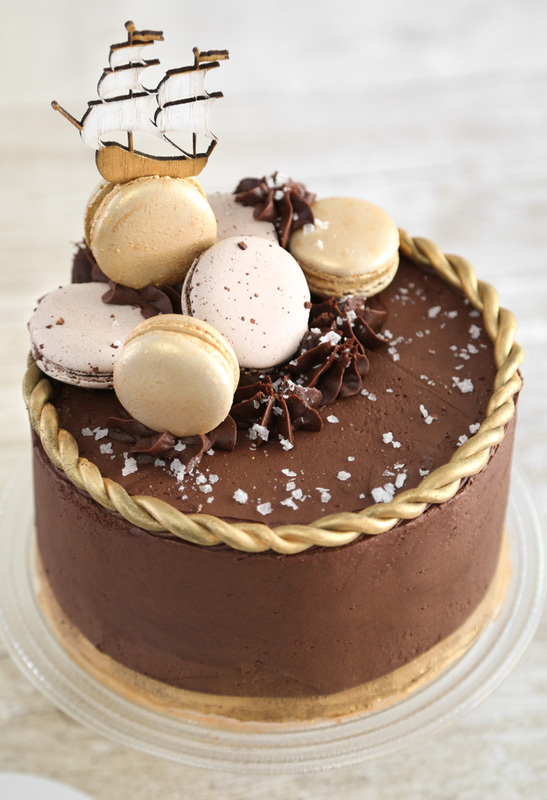 Also, since this cake is double frosted, use a 9-inch cake stand or larger for display. Make the butter cake: Preheat the oven to 350°F. Grease three 8-inch (or 9-inch) cake pans with vegetable shortening or cooking spray and line the bottoms with parchment rounds. In the bowl of a stand mixer fitted with the paddle attachment, cream the butter and sugar until lightened in color and fluffy, 4-5 minutes. Add the eggs, one at a time, mixing well after each addition. Mix in the vanilla extract. Sift together the flour, baking powder, and salt. Add the flour mixture to the butter mixture in 3 additions, alternating with the milk, begin and end with the flour mixture, and beat after each addition until well combined. Beat until the batter is smooth and thoroughly combined. Bake for 25-30 minutes or until a skewer inserted into the centers of the cakes comes out clean. Cool for 10 minutes in the pan. Loosen the sides with a small, thin offset spatula. Invert the cake layers, remove the parchment rounds, and transfer the cakes to cooling racks. Cool completely. Level the tops of the cakes with a serrated knife or cake leveler. Make the caramel frosting: melt the butter in a saucepan over medium-low heat. Add the brown sugar and milk and increase the heat to medium-high. Bring the mixture to a boil and stir until the sugar is completely dissolved. Remove from heat and stir in the salt and vanilla extract. Let the mixture cool until just warm. Pour the mixture into the bowl of an electric mixer and add the powdered sugar; beat until well combined. 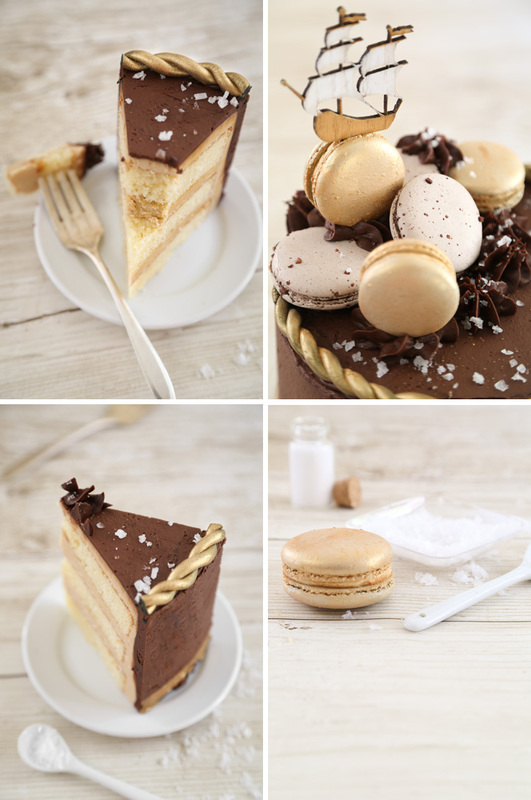 Immediately fill 2 cake layers each with 1/2 cup caramel frosting and stack them. Transfer the remaining frosting to a large piping bag fitted with a flat cake icer tip (#789) (this caramel frosting has a thick, almost fudge-like consistency, so it’s very difficult to spread – trust me, this decorator tip is the trick!). Pipe the frosting around the edges of the cake and on top in thick overlapping ribbons. When the cake is covered, gently pat the frosting with your fingers until a smooth surface is achieved. The caramel will begin to firm and should not stick to your fingers. This layer of frosting doesn’t have to be perfect; you just want to get a relatively even layer of caramel covering the cake. Refrigerate the cake while you prepare the mocha frosting. Make the mocha frosting: Cream the butter in an electric mixer fitted with the whisk attachment. Add the powdered sugar and cocoa powder. Mix on low speed until the mixture begins to come together. Add the dissolved coffee and vanilla extract. Mix on medium speed for 1 minute, then increase to high speed and beat until light and fluffy. Scrape the bowl down and beat again until all the ingredients are well incorporated. Remove the caramel-covered cake from the refrigerator and frost the top and sides with the mocha icing using an offset spatula. Transfer the remaining icing to a piping bag fitted with a large star tip. Pipe a few large stars on the top left side of the cake. 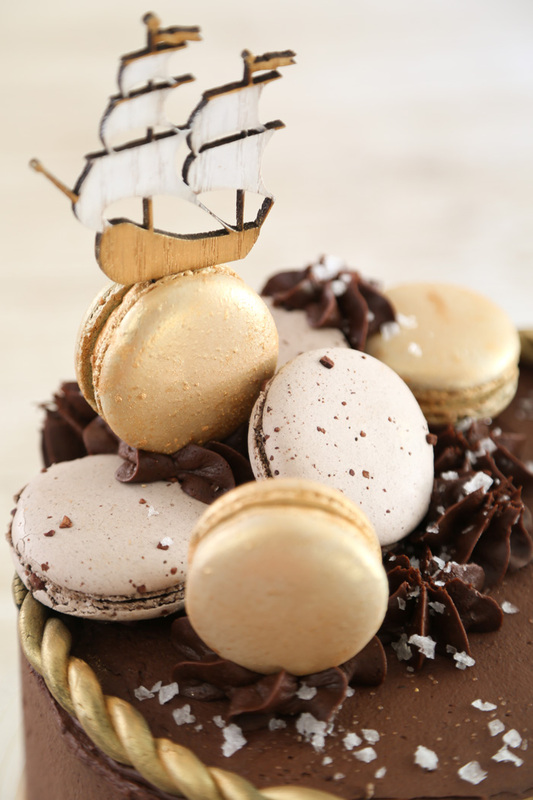 Dust 3 macarons with the gold luster dust; arrange all of the macarons on top of the piped stars. Scatter flake sea salt on top of the cake (about two to three pinches). Refrigerate the cake until firm. Decor: While you wait for the cake to chill, roll the chocolate fondant out into two long skinny ropes beneath your palms to about 16 inches long. Twist the two ropes together and lay the piece on a sheet of waxed paper. Using a small artists’ brush, brush gold luster dust over the piece until completely gilded. Remove the cake from the refrigerator and attach the rope around the top edge of the cake with small dots of mocha frosting. While the cake is still cold and the icing is still firm, use clear acetate to cover the entire upper portion of the cake (secure the plastic with tape), exposing only 1 1/2 inches around the bottom. Brush the exposed area with the luster dust. Remove the plastic. Allow the cake to come to room temperature before serving. Wow this cake looks just stunning! Thank you..and for the links..I bet the double frosting makes it amazing.I am anxious to try this technique.Beautiful cake. You blow my mind with your creativity. This cake it stunning! This cake looks completely perfect in every possible way! :) I love salted caramel mocha! Wow, this cake is stunning. You always take it up a notch. Wow and wow--that cake! Include me in the giveaway --what a fun celebration! An absolutely stunning cake! You are such an artist! As a real lover of the salty-sweet combination, I'm really tempted by your book. All that's stopping me ordering it is my uncertainty over whether measurements include metric gram weights. Could you perhaps answer that query please, Heather? I wouldn't order a book that uses cup measures you see -rather wait for a metric version. As usual, today's cake looks stunning and no doubt tastes rather good. So much artistry in every one is incredibly impressive. Metric weights are included throughout the book. There's a preview of the Bananas Foster Belgian Waffle Sundae ingredients on Amazon's 'Look Inside' feature if you'd like to see how it's written. Thanks for asking! Double frosting? What a brilliant idea. My husband may disagree but I say the more frosting the better! Love this! My MIL made a really awesome sea salt and caramel tart a couple if years ago that still has me dreaming of one more slice. Double frosting?! I didn't know that was a thing either, but I'm so glad you made it one! 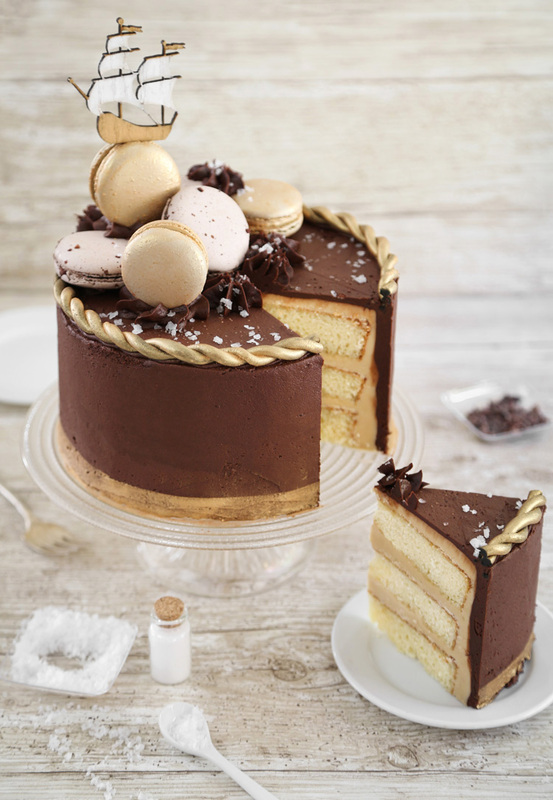 Seriously, everything about this cake looks fabulous! OHHHHHH!!! This is just sooo beautiful!! How did you ever got that perfect twist on there, it looks like it's made from wood, just so perfect. The whole cake is pure perfection! Congratulation on the book, i am so checking it out! Hello Heather I have a question. Have you ever tried the Fresh N easy boxed frosting mix? The frosting comes in a powder you mix some butter and water and you have your frosting. Well its the best frosting I've ever had. Fresh N easy is going out of business and now I'm frantic because i won't be able to get that frosting and wanted to know if you could recommend a recipe for frosting similar to that. Something that you don't have to worry about refrigeration and what not. Dark chocolate chip cookies with a sprinkling of fine sea salt! such a lush cake! I am just gob-smacked. Perfection. I just made this cake. My only concern was that the mocha frosting never really got light and fluffy for me. It was quite thick and almost dry looking. It might have benefited from a little more liquid of some kind. But, it tasted good. I can't wait to try it! Thanks for always being my go to baking inspiration? Mmmm this looks so good,I can't wait to make it! This recipe looks amazing! What kind of coffee do you recommend using? Regular grounds or espresso powder? This recipe looks amazing! What kind of coffee do you recommend using? Regular grind or espresso powder? How do you think the caramel frosting would do under fondant? I have made this cake 3 times. It is a crowd pleaser! Just wondering what your thoughts were on completing up to the caramel icing step then covering in fondant instead of the mocha frosting. If you can manage to get the caramel frosting on relatively smoothly, then it should behave just fine under fondant. I always have trouble getting this particular caramel frosting perfectly even (you may need to work quickly!). I'd make sure the caramel-frosted cake is good and chilled/firm before applying the fondant.